As the race to the White House accelerates with the GOP convention, a social data analysis of 100 million tweets reveal key characteristics of the average supporters of presumptive presidential nominees, Hillary Clinton and Donald Trump. Social intelligence company Brandwatch released an infographic yesterday with details. Brandwatch uses its social listening and analytics technology to track how the 2016 presidential elections are playing out on social media. As U.S. voters count down to November, Brandwatch will continuously collect key data and insights, including sentiments around candidates, key moments, volume of mentions, trending topics, popular hashtags, important issues and more. Data around key events like conventions, vice presidential appointment announcements, final debates and election day itself will be tracked in real time and available to the public. "Social is clearly the new polling station, and we are interested in the impact it has on the election. Combine this excessively dramatic election season with a very vocal – and social – public, and the data might actually predict the outcome," said Kellan Terry, data analyst at Brandwatch. Social is a valuable measure of how exactly the campaigns are playing out in the eyes of the public and the insights derived from the data is riveting. 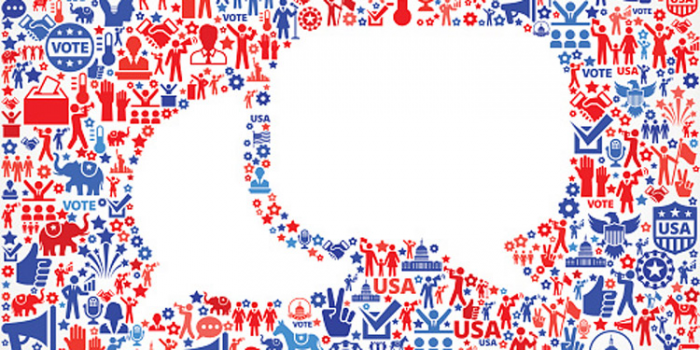 Brandwatch's 2016 U.S. Presidential Election Data Visualization will help paint a picture of the public's online conversation around each presidential candidate every week with real-time data. Nearly 100 million Twitter mentions between January 1, 2016 and June 15, 2016 were analyzed to better understand the traits of social supporters of the two presumptive presidential nominees. Cross-layering each candidate's conversation with pro-candidate speech and hashtags, and assuming the aforementioned speech aligns with the definition of a typical conservative/liberal from a third-party research center, allowed Brandwatch to extract the insights represented within the infographic. Beyond the election, Brandwatch's social listening platform is used by over 1,200 brands and agencies, including Cisco, Whirlpool, British Airways, Heineken, Walmart and Dell. The company has offices around the world, including Brighton, New York, San Francisco, Berlin and Singapore.